İsa Bey Mosque (tr. İsabey Camii) is situated at the foot of Ayasoluk Hill in Selçuk. It is one of the finest examples of Seljuk architecture in Anatolia. Katharina Otto-Dorn established that this is the oldest Turkish mosque with a courtyard, as well as the oldest colonnaded mosque with a transept (i.e. a transverse nave) in Anatolia. This mosque is often compared to İlyas Bey Mosque in Miletus, dated to the same period. The mosque is named after its eponymous founder - İsa Bey - a member of the local ruling family. He belonged to Aydınid dynasty (tr. Aydınoğulları), which reigned over the so-called beylik (a kind of Turkish district principality) in the area of the Aegean coast of Asia Minor. Their capital was the first in Birgi, and then - in Selçuk. In both cities, numerous architectural monuments from this period of history have been preserved, and İsa Bey Mosque is one of its best representatives. According to the inscription placed on the building, its construction was completed in 1375. The architect responsible for the erection of the mosque was Şamlı Dımışklıoğlu Ali. The Seljuk origins of the building are visible in ornamental arabesques, faience mosaics, the western portal of monumental height, and lavish decorations. As a result of the earthquakes that hit Selçuk region in 1653 and 1668, the mosque was severely damaged. One of its two minarets collapsed completely, and the second one - collapsed at the height of its balcony. Also, the colonnades surrounding the courtyard were destroyed. In the 19th century, the ruined mosque was used as a caravanserai. With funding provided by the General Directorate of Foundations, a thorough renovation of the mosque was carried out in 1975. Since then it is open to the faithful Muslims and the tourists. Another renovation of the building took place in 2005. İsa Bey Mosque is very well preserved. It has two main entrances: from the east and the west. Its western walls are covered with marble and the others - with hewn stones. The rectangular plan of the mosque has dimensions of 48 to 56 meters. Its roof is topped by two domes with a diameter of 9.4 and 8.1 meters. The circuits of these domes are decorated with ceramic tiles from İznik. The inner courtyard with a fountain is surrounded by 12 columns. The columns were brought here from the ruins of ancient Ephesus. The western wall is decorated with engraved inscriptions and geometric shapes. The wall is covered with marble, while the façades on the remaining sides are made of cut stone. The interior of the mosque consists of two aisles covered with two domes in the centre. There are a mihrab and a pulpit (mimbar), both made of marble. The columns supporting the roof are also classical, from Ephesus ruins. The mosque now has one minaret, built of brick on an octagonal plan. Once it was adorned with the second minaret, which was not rebuilt after the earthquake in the 17th century. In the vicinity of the mosque stands an octagonal Seljuk mausoleum built with stones and bricks, with a pyramid-shaped roof. The mosque is open to visitors except for prayer times. During the visit remember to behave according to the rules set out for the guests: take off your shoes at the entrance, dress decently and, in the case of women, cover your hair. Tourists can visit only one section of the interior. 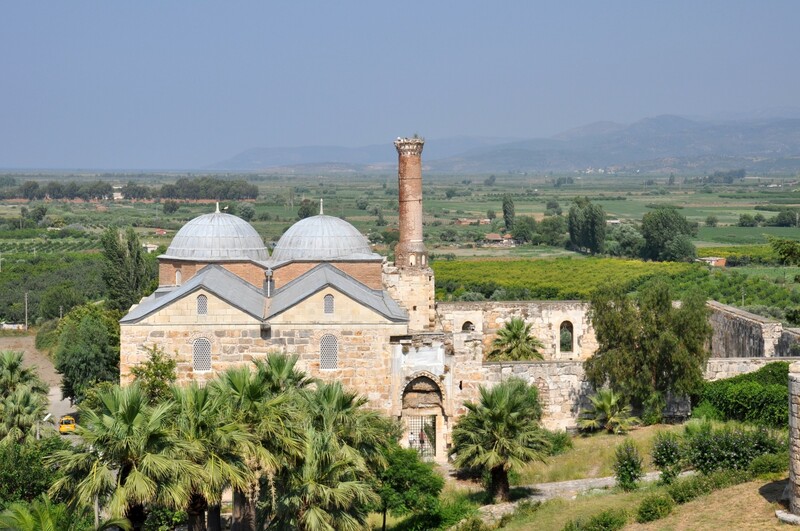 İsa Bey Mosque is located on the west side of the city of Selçuk, at the intersection of St. Jean Caddesi and 2040 Sokak.It stands only 300 meters from the ruins of the Temple of Artemis and 250 meters from the entrance to the Basilica of Saint John.